Herb butters are delicious and so easy to make for they are butter, a bit of chopped fresh herb and a squeeze of fresh lemon juice. Packed into a small crock, they're pretty enough to put on the table if you'd like. But as fall approaches, itis always nice to have herb butter in the freezer. 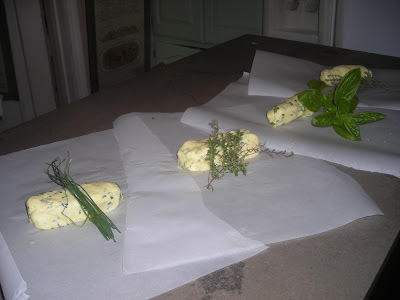 Each stick of a pound of butter, get's it own herb, rolled into a log, wrapped in parchment, labeled and then frozen. From chive, to savory, to basil to thyme. And then labeled for the freezer. 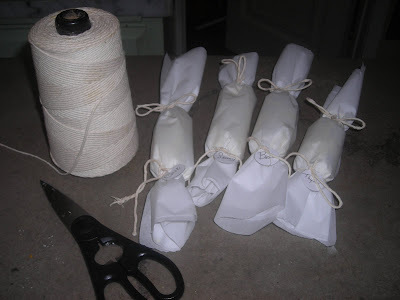 It is so easy, to pull out the log, cut off a pat or two to use and then put back into the freezer. You can also thaw a log, put into a crock and put on the table. Chive butter is a favorite and you can use it on almost everything! Baked potatoes, eggs, steak. Savory butter we use on green or wax beans, summer squash or zucchini, or to top a poached egg. Basil butter is great on any tomato dish, on eggs, on a Cornish hen or in a pot of bean soup. Thyme butter is great to use in stuffings, gravy, on pork chops or on hot vegetables. 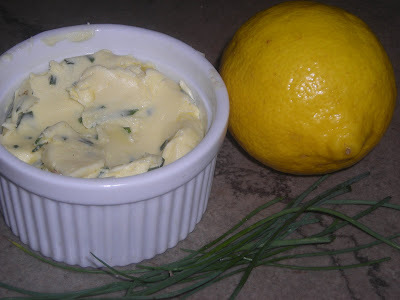 Herb butter is easy to make. A stick of butter at room temperature, 2 to 3 teaspoonfuls of chopped fresh herbs and a squeeze of lemon juice (the juice of 1/2 lemon is just right). Make sure the butter is really soft (leave it out overnight is good) and then work the herbs and lemon juice into the butter. 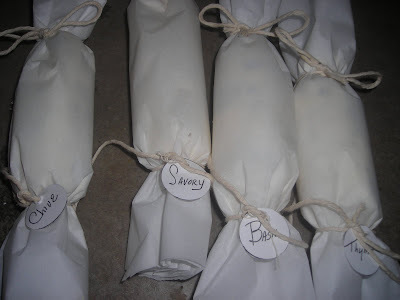 You can put into a crock for immediate use or wrap in parchment and freeze. This is a really good idea. I never thought to freeze herb butters. Thanks for the tip. What a great idea! These would make wonderful hostess gifts. Martha, you herb butters are lovely. 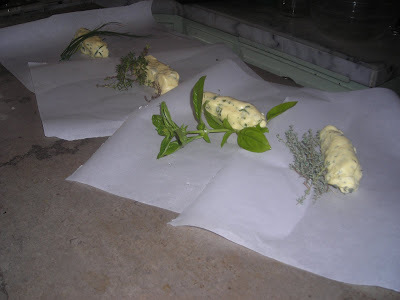 I've never wrapped them in parchment for freezing before, but I love how they look. I will try it your way.